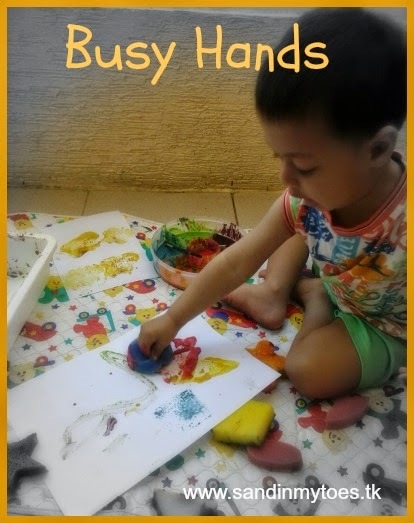 It's fun to do craft projects on their own, but it's even better when kids can engage in creative and imaginative play with what you've made together. I've put together this list of crafts that you can help kids make and then play with using lots of imagination! Follow the links for complete tutorials. Do your kids like outer space and sci-fi? Try this DIY Glove Box from Gift Of Curiosity which would be so much fun for pretending to be scientists or astronauts! 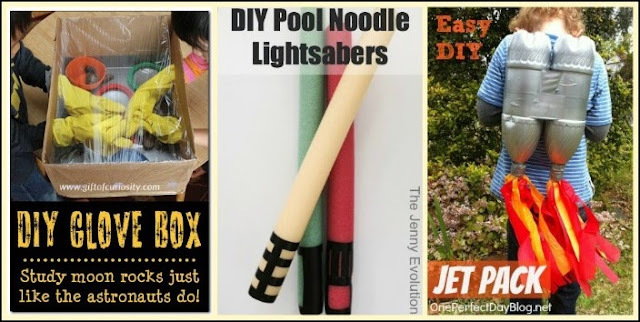 And who can beat these Pool Noodle Lightsabers from The Jenny Evolution? They are so easy to make, and can lead to hours of fun in the pool, or out of it. Budding astronauts will love this DIY Jet Pack from One Perfect Day Blog! From our own blog, check out this Egg Box Alligator Puppet - great for kids who are animal lovers! 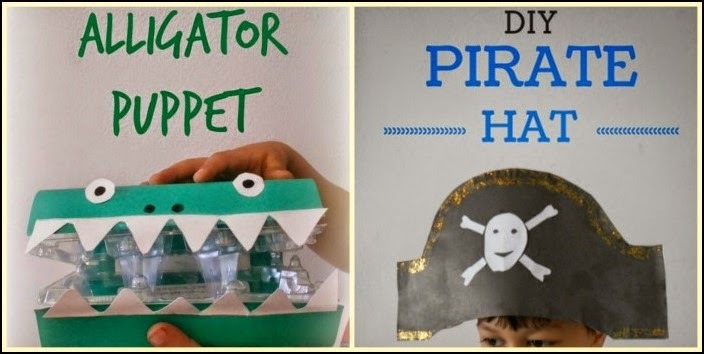 And for the swashbuckling pirates, this easy to make DIY Pirate Hat is great for playing dress-up. Have a kid who is inclined towards nature? They'll love this Shamrock Crown and Wand from The Craft Train. 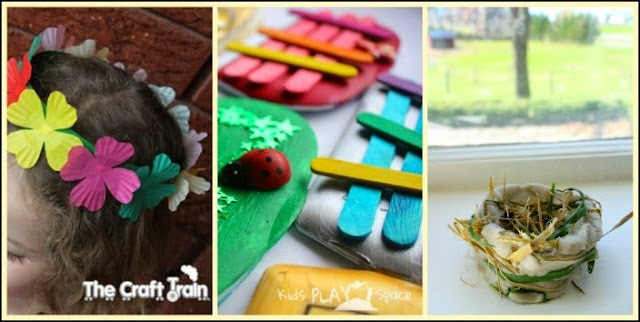 These Recycled Craft Fairy Doors from Kids Play Space are sure to fire up the imagination in your garden! Also try making this Clay Birds Nest from How Wee Learn - a fun craft activity for kids who like birds. For the pretend play enthusiasts, help them make this simple DIY Play Tablecloth from Be A Fun Mum. 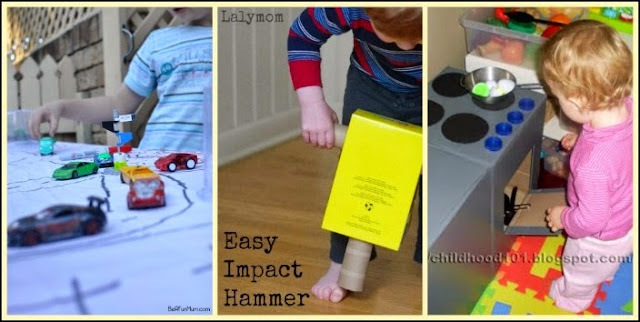 This Cardboard Impact Hammer Toy from Lalymom would be so much fun to play with! Lastly, make this DIY Kids Kitchen from Childhood 101 by spending less than ten dollars. Kids need very little by way of material for play - their imagination does the rest! 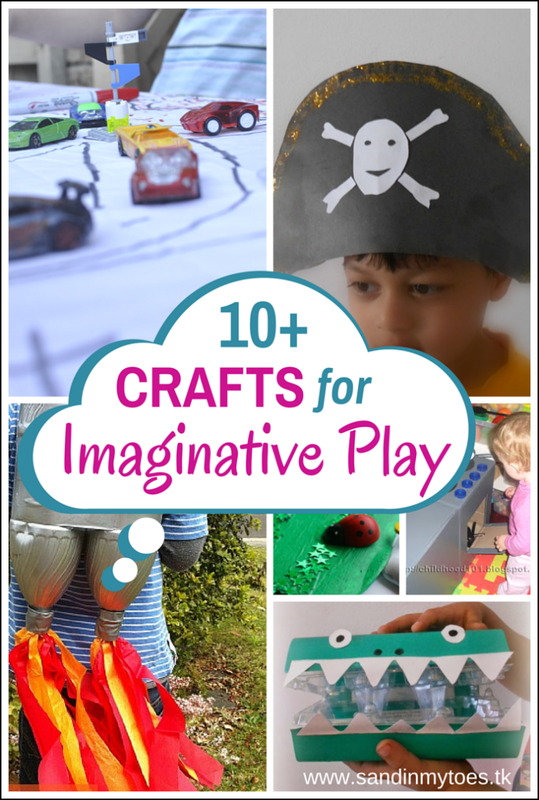 Do check out my tips for encouraging imaginative play in your child. Such a lovely selection of ideas. Lots of lovely ideas, I like the fairy doors.